When is the last time you said, “I love my spine”? Usually, declarations of endearment like that would follow something unique, like an extraordinary feat of strength. On October 16, Canadians across the country are invited to say just that and celebrate World Spine Day by embracing the skeletal system that’s had their back throughout their lives. Many back problems come from a common cause – poor posture stemming from poor body mechanics. You’re probably not surprised to hear it but those hours spent sitting at a desk, hunched over a smartphones and bending over and lifting with your back can add up. Fortunately, turning back the clock on the different ways we build poor posture is a lot easier than you think. In fact, you may already be doing things that help to protect your health. First off – check your posture! Stand against the wall. Your head, upper back and backside should all be touching the wall. If holding this position is uncomfortable, it is likely that you have poor posture. If you’re like most people, there is probably some room for improvement. Signing up for a yoga class may be out of your comfort zone, but there are things you can do from the comfort of your own home to love your spine. Try stretching! Stretching as little as three times a week can have a dramatic affect on relieving pain and improving flexibility. The stretching program on straightenupalberta.com is free and provides stretches and tips for both adults and kids. Take a look at your furniture. We spend a lot of time sitting and lying down; make sure your furniture is ergonomically friendly and right for you. You can get started with our blog posts on taking a look at the drivers seat in your car, picking the right bed and adjusting your desk at work. 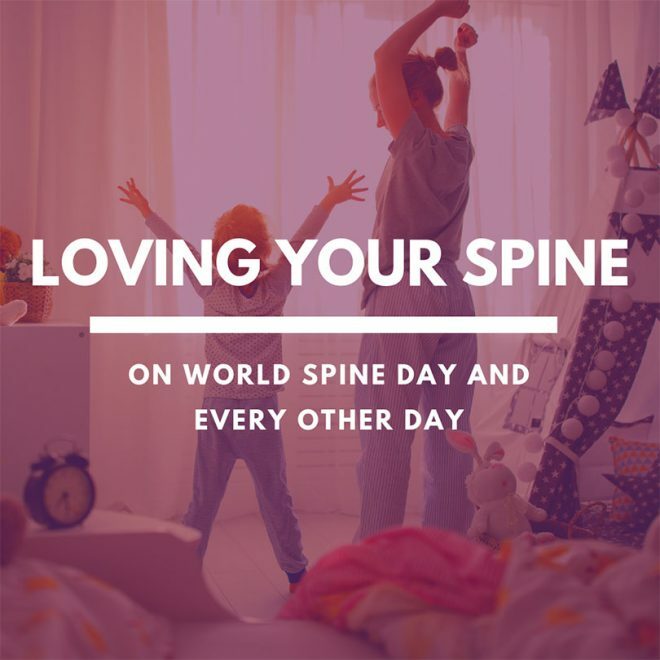 In honour of World Spine Day, the Canadian Chiropractic Association has developed an educational booklet to empower Canadians like you to love your spine. You can download it here on their website. The ACAC Blog, Everyday Chiropractic, is a great place to start learning about spinal health (in our humble opinion). Try starting with Protecting Your Back at Home, Protecting Your Back at Play and Protecting Your Back at Work. It’s important to listen to your body when it starts to hurt. Stretching and gentle exercise may help some conditions but if your pain hasn’t subsided after a few days, seek advice from a chiropractor.